One of my favorite cafes to study at in Chicago! It is in the heart of pilsen and is a wonderful "hole-in-the-wall" type cafe that supports local artists, serves delicious coffee, and has amazing lunch/snack options! The location is difficult for some people and the seating is not too much, but the food definitely makes up for these low points. Still a great place to study in Chicago. There hasn't been as big of a crowd here and its open till 9pm so I have found it a little better atmosphere than before. This time I tried the smoothies and another food item and it was just OK. Check out reviews below, but for now the rating will remain the same. I always love coming here... This time I tried one of their soups which you will see below. Still an amazing place to study and just hangout. The atmosphere was cold though and the coffee this time was luke warm which was disappointing. The soup and coffee experiences counteracted my opinion, so for now, the 3.5 mile rating stays. This was my first time trying pozole soup outside of what I have made at home. It is a Colombian style soup that is made with green chiles, small pieces of chicken, lots of spices, and dried maize or hominy. The hominy are the corn like dumplings swimming in the green soup. They have a spongy consistency which is addicting. This soup was nice and hot in the cold coffee shop. It had the perfect spice and was served with tortilla chips to crunch on top. Delicious soup! Served on little crackers, these "little bites" pack a lot of flavor. I chose the chicken salad ones, but you could also get tuna salad. It comes with a piece of American cheese and avocado on top. The chicken salad was a little too sweet for my liking and the American cheese was a random addition. The cracker was a good salty vessel for the snack. It comes with four, which is a little pricey but it is a healthy snack while studying. I chose to get my smoothie made in water as opposed to milk or soy milk. They do give an option and have lots of other flavors like banana, strawberry, pineapple, coconut, etc. When made in water, it reminds me more of a slushie with only a hint of guava flavor. 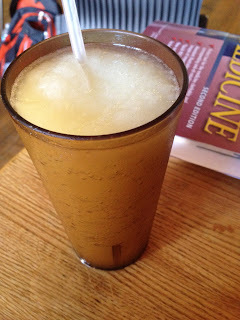 It was very watered down, but it was refreshing during the hot summer days we have been experiencing. My friends had different flavors which they both liked. I haven't had any other flavors, so let me know what you think! Where else can you get an Arepa when studying? This dish is a Colombian arepa which is a grilled white corn flatbread. Mine was topped with melted chihuahua cheese, fresco cheese, and fresh vegetables including roasted red peppers, zucchini, mushrooms, lettuces, and tomato. And with a nice cup of coffee...Definitely a great way to study!! Freshly baked tomato and herb focaccia... Filled high with a marinanted chicken breast, chihuahua cheese, lettuce, tomato, and some kind of homemade chipotle cream sauce. It was served nice and warm!! And had an amazing pasta salad side... Tons of fresh veggies and not too creamy. The chipotle cream sauce was layered on thick, so maybe ask for light if you don't like too much fat added to your sandwich. 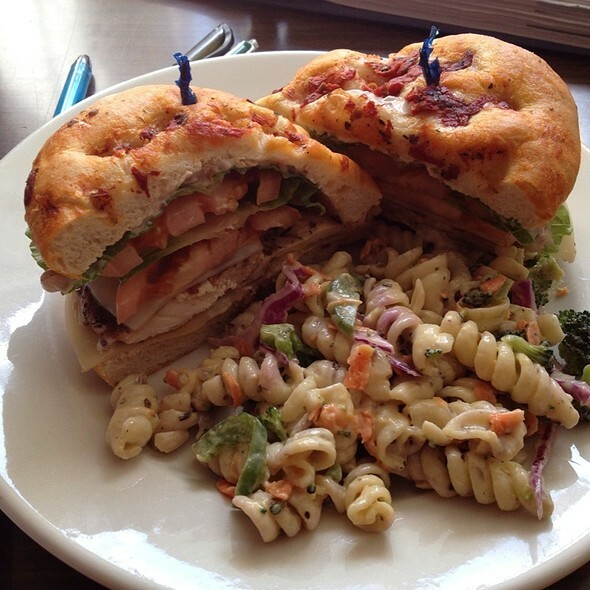 It is still another perfect meal when studying! - Come here to study! It is never too loud and has free WiFi! - Definitely try the arepas!... I suggest the vegetarian one because the plain one doesn't taste like anything and the meat one is overpowered by the corn taste. - Don't drive here... the free parking is farther from the place. 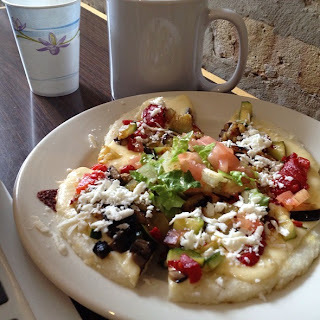 I suggest riding your bike and then grabbing dinner at one of the local pilsen restaurants!